Our 24 hour pet hospital is located in Grand Rapids and also serves Grandville, Holland, Muskegon. Caledonia, Lowell, Wyoming, Kentwood, Cascade, Coopersville, Byron Center, Walker, Zeeland and western Michigan. It’s a pet emergency, but everyone should stay calm. That’s a goal that the BluePearl vets in Grand Rapids help to fulfill every day. Our veterinarians are leaders in low-stress handling to promote calm and comfort for pets in our care. 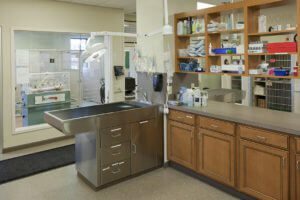 While dogs and cats bask in pheromones, their humans can take comfort in knowing about the board-certified specialists and the high tech equipment at our 21,000 square-foot hospital. Ours is the premier 24-hour emergency and specialty hospital in western Michigan. The devoted and skilled team is ready to provide the highest quality care and attention for your pet. Whether it’s an emergency or your family vet office is closed, we’re here to help. 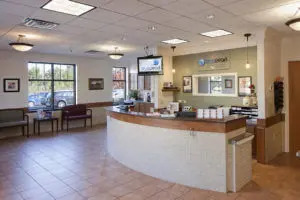 Since becoming part of BluePearl in 2008, we have been expanding our range of specialty services to better serve our patients and the veterinary community. Our diagnostic equipment includes a CT scanner, endolaser, diode laser and digital radiology. And our staff includes a client liaison who strives to keep you informed, so you’ll know exactly how your pet is doing. Feeling calm yet?